St. Augustine’s Episcopal Church on Lower College Road held their second “Feed a Friend” event of the year Tuesday night, which invited students to enjoy a home-cooked meal with absolutely no-strings-attached. Archdeacon Janice Grinnell, who joined St. Augustine’s in 2012, is always looking for ways to get involved with the student community and established the Church as a come-as-you-are community. St. Augustine’s is an LGBTQ Safe Zone on campus, and offers support and acceptance of all lifestyles. Feed a Friend, which has been going on since 2013, is a monthly dinner cooked by the Church’s parishioners meant to provide a home-cooked meal for anyone who wants to show up. The Church hosts seven of these events throughout the year. Grinnell urges that Feed a Friend is a no-strings-attached event, and is meant to be an opportunity to enjoy home-cooked dishes and a welcoming community. Upon arriving, people are asked to fill out name tags, and also asked to write the pronoun they prefer to be addressed as on the name tag. Grinnell said that another intention of these events is to further St. Augustine’s from the perception many people have of religion in the collegiate community. She made reference to the religious groups that frequently stand outside of the Memorial Union and hand out Bibles. 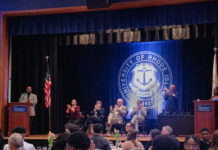 St. Augustine’s, in addition to hosting these student focused events and regular Episcopal masses, also houses the campus food pantry, Rhody Outpost, which is a much overlooked resource on campus. It is now student run, and housed at the church. Twice a month, it is open for students who have food deficiencies and are in need. Students can also access Rhody Outpost at any time by contacting the Outpost. Grinnell expressed her admiration for University President David M. Dooley, and his deftness in addressing situations involving student need. Grinnell hopes that awareness of Feed a Friend and the many other beneficial programs the church offers will grow, so more students can find the kind of acceptance that St. Augustine’s offers to everyone. She urged the importance to taking advantage of opportunities given to you, which might lead to self-betterment. The next Feed a Friend event will be held on Nov. 16 between 5:30 and 7 p.m., and will be a Thanksgiving dinner, free for students, with no-strings-attached.